Iowa State engineers are developing real-world, low-cost applications for graphene. Photo: Christopher Gannon/Iowa State University. Graphene is an atom-thick sheet of carbon that has several impressive properties: it's great at conducting electricity and heat, and is strong and stable. But researchers have struggled to move beyond tiny lab samples for studying its material properties to larger pieces for real-world applications. Recent projects that used inkjet printers to print multi-layer graphene circuits and electrodes had the Iowa State nanoengineers thinking about using this technology to produce flexible, wearable and low-cost electronics. For example, "Could we make graphene at scales large enough for glucose sensors?" asked Suprem Das, an Iowa State postdoctoral research associate in mechanical engineering and an associate of the US Department of Energy's Ames Laboratory. But there are problems with the existing inkjet technology. Once printed, the graphene has to be treated to improve its electrical conductivity and device performance. This treatment usually requires high temperatures or chemicals, both of which can degrade the flexible or disposable surfaces such as plastic films or even paper that the graphene is printed on. So Das and Claussen came up with the alternative idea of using lasers to treat the graphene. Claussen, an Iowa State assistant professor of mechanical engineering and an Ames Laboratory associate, worked with Gary Cheng, an associate professor at Purdue University's School of Industrial Engineering, to develop and test the idea. And it worked. They found that treating inkjet-printed, multi-layer graphene electric circuits and electrodes with a pulsed-laser process improved the graphene’s electrical conductivity without damaging the paper, polymers or other fragile surfaces on which it was printed. "This creates a way to commercialize and scale-up the manufacturing of graphene," Claussen said. The findings are detailed in a paper in Nanoscale. Claussen and Cheng are the lead authors and Das is first author. Additional Iowa State co-authors are Allison Cargill, John Hondred and Shaowei Ding, graduate students in mechanical engineering. Additional Purdue co-authors are Qiong Nian and Mojib Saei, graduate students in industrial engineering. The Iowa State Research Foundation has already filed for a patent on the process. "The breakthrough of this project is transforming the inkjet-printed graphene into a conductive material capable of being used in new applications," Claussen said. Those applications could include sensors with biological applications, energy storage systems, electrical conducting components and even paper-based electronics. 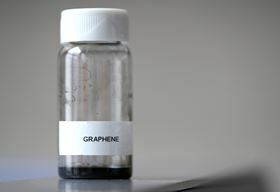 The process they came up with uses a computer-controlled laser to selectively irradiate inkjet-printed graphene oxide. This treatment removes ink binders and reduces graphene oxide to graphene – physically stitching together millions of tiny graphene flakes. The process also improves graphene’s electrical conductivity by a factor of more than 1000. "The laser works with a rapid pulse of high-energy photons that do not destroy the graphene or the substrate," Das said. "They heat locally. They bombard locally. They process locally." The localized laser processing also changes the shape and structure of the printed graphene from a flat surface to one with raised, three-dimensional (3D) nanostructures. The engineers say the 3D nanostructures are like tiny petals rising from the surface that increase the electrochemical reactivity of the graphene, making it useful for chemical and biological sensors. All of that, according to Claussen's team of nanoengineers, could move graphene to commercial applications. "This work paves the way for not only paper-based electronics with graphene circuits," the researchers wrote in their paper, "it enables the creation of low-cost and disposable graphene-based electrochemical electrodes for myriad applications including sensors, biosensors, fuel cells and (medical) devices." This story is adapted from material from Iowa State University, with editorial changes made by Materials Today. The views expressed in this article do not necessarily represent those of Elsevier. Link to original source.